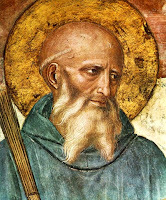 In the Revelations of St Gertrude (+1302) we read that St Benedict, in a vision to St Gertrude, promised to assist, against the attacks of the enemy in the hour of death, those who commemorate his privilege of dying while standing in prayer in the oratory of his monastery. Stans in Oratorio, dilectus Domini Benedictus, Corpore et Sanguine Dominico munitus, inter discipulorum manus imbecillia membra sustentans, erectis in coelum manibus, inter verba orationis spiritum efflavit, qui per viam stratam palliis, et innumeris coruscam lampadibus, coelum ascendere visus est. V. Gloriosus apparuisti in conspectu Domini. R. Propterea decorem induit te Dominus. Deus, qui pretiosam mortem sanctissimi Patris Benedicti tot tantisque privilegiis decorasti: concede, quaesumus: ut cujus memoriam recolimus, ejus in obitu nostro beata praesentia ab hostium muniamur insidiis. Per Christum Dominum nostrum. Amen. Benedict, the beloved of our Lord, whilst standing in the Church, having been fortified with the Body and Blood of the Lord, supporting his failing limbs on the arms of his disciples, with his hands upraised to Heaven, breathed forth his soul amidst words of prayer, and was seen ascending into heaven by a path most richly hung with tapestry, and lit up with countless lamps. V. Thou didst appear glorious in the sight of the Lord. R. Therefore did he clothe thee with beauty. O, God! who didst adorn the precious death of most holy Father Benedict with so many and so great privileges; grant we beseech thee, that at our death we may be defended from the snares of our enemies, by the blessed presence of him whose memory we celebrate. Through Christ our Lord. Amen.